position as the world’s biggest interiors magazine brand – collectively, we sell more than two million issues a year! We also handed out our coveted annual awards to the industry’s most innovative products and designers. I returned home determined to put together an issue that would be focused on international greatness, while still championing all things British. Quite a big challenge, but hopefully you’ll appreciate our Global Design special, including coverage of our worthy award winners, alongside the absolute best in international architecture, the hottest hotel interiors and cutting-edge design boutiques around the world. Plus, as our minds turn to the prospect of holiday escapes in sunnier climes, I was also keen that all of this month’s exceptional homes would be available to rent, so that, in theory, any of us could live the ELLE Decoration dream – even if just for a week or two this summer. GIVE ME SHELTER Kettal’s ‘PH1’ pavilions can be put together in different combinations to suit your garden’s needs – ceiling panels include waterproof and slatted options, while side panels can incorporate blinds, curtains, shelving or glass. From £14,915 ( kettal.com). SITTING PRETTY Japanese furniture brand Maruni, which celebrates its 90th anniversary this year, has worked with longtime collaborator Jasper Morrison to create the ‘Fugu’ chair. ‘The idea was to create a wooden seat so comfortable it wouldn’t need upholstery,’ says Morrison of his elegant, lightly curved design made from solid oak. From £1,500 (maruni.com). IN THE ROUND The gentle curves of Danish design brand Space Copenhagen’s new ‘Gleda’ lounge table for Benchmark will lend minimalist homes a soft, organic feel. The table comes in two height options, and a choice of sustainable natural, whitened, aged or ebonised oak. From £795 (benchmarkfurniture.com). Using steam-bending techniques, Benjamin Hubert of design studio Layer has created a smooth, curved timber basket for Fritz Hansen. Inspired by the midcentury furniture that the iconic Danish brand is known for, the piece is available in natural oak, stained oak and walnut. From £209 (fritzhansen.com). ‘NASSA’ SCREEN BY MARTA AYALA HERRERA FOR YAMAKAWA RATTAN Spanish designer Herrera’s fresh style teamed with this brand’s know-how has resulted in an ultra-modern piece. From £1,769 (yamakawa-rattan.com). ‘PAL’ STOOL BY SAMI KALLIO FOR NORTHERN The rattan top on this three-legged seat by Finnish-born, Gothenburg-based designer Kallio lends it extra charm. From £237.49, Clippings (clippings.com). 3 ‘THE RATTAN VENUS CHAIR’ BY SOANE BRITAIN This delicately scalloped seat with a forged metal base is handmade in the brand’s specialist rattan workshop in Leicestershire. £5,900 (soane.co.uk). PA P E R VA S E COVERS BY PEPE HEYKOOP To produce these sleeves, which add colour to plain vases, Heykoop works with the Tiny Miracles Foundation, paying women of Mumbai’s Pardeshi community to make them. Proﬁts go towards education and healthcare. £18, Aram (aram.co.uk). Proudly display your love of ﬂowers by turning a wall into a meadow, with this exquisite hand-painted and embroidered design. Price on request (fromental.co.uk). OUTSIDE INFLUENCERS Designed to weather summer storms – but with style credentials worthy of any interior – these new seats are the perfect update for your garden ‘TRIANGLE’ CHAIR, STELLAR WORKS Adapted from its original wooden version, created in 1952 for Denmark’s Louisiana Museum of Modern Art, designer Vilhelm Wohlert’s chair has been reissued in outdoorready aluminium. £816 (stellarworks.com). ‘ B R E A’ S O FA , DEDON The star of UK design duo Barber & Osgerby’s second collection for German outdoor furniture brand Dedon is this modular sofa, built around a simple tubular frame. It has slip-on covers that can be removed speedily at the ﬁrst sign of wet weather. Available January 2019 (dedon.de). THE BEST NEW DESIGN BOOKS We reveal the two tomes that will be gracing the most stylish coffee tables this summer WOMEN DESIGN BY LIBBY SELLERS Design historian, author, gallerist and former curator at London’s Design Museum Libby Sellers’ new book profiles the lives and work of 21 of the world’s most prominent female creatives. Pioneers such as Eileen Gray, Ray Eames and Eva Zeisel are celebrated alongside today’s innovators, from Neri Oxman to Patricia Urquiola and Nathalie du Pasquier. It’s a fascinating insight into the women who have shaped the way we live (£20, Francis Lincoln). NEW WAVE CLAY: CERAMIC DESIGN, ART AND ARCHITECTURE BY TOM MORRIS Design journalist Morris has seized upon the current appetite for all things craft with his latest book. Delving into the world of experimental ceramic furniture, murals, vessels, 3D printing and even clay-based buildings, he shines a light on 55 exciting designers at the very forefront of the movement (£32, Frame). 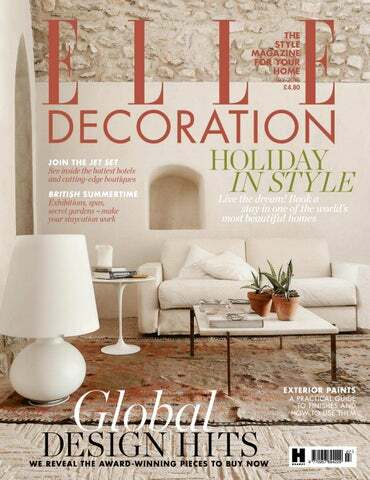 The brand new volume of ELLE Decoration Country is out now. It’s your invite to the world’s most beautiful homes in the countryside, packed with seasonal style inspiration, breathtaking views and our edit of the pieces that will help you recreate the pared-back look in your own home. And all for just £9.99. Order online (with free post and packaging) at hearstmagazines.co.uk/elle-decoration-specials or pick up your copy at selected WHSmith stores. ‘We designed The Ned to feel not only like a grand hotel, but to have the comfort of an old country house’ Fans of the hotel can achieve its luxurious look at home with Soho Home’s accompanying collection. Highlights include stylish ironframed beds and headboards upholstered in William Morris fabrics (inspired by the look of the ﬁrst-class cabins on the Titanic), velvet sofas with pleated backs and Art Deco-style mirrors. Every detail is considered, from the bankers’ green used for the reworked archive pattern on the ‘Burleigh’ china to the pick of sumptuous dusty pink, teal and burnt orange shades for the cushions (sohohome.com). A style icon on what they’re reading, watching, listening to and more London-born Bella Freud launched her eponymous fashion label in 1990, and has since brought her bookish brand of cool to collaborations with heritage British labels from Biba to Barbour. Now, she is turning to interiors: Freud recently transposed the slogans that adorn her cult jumpers – song lyrics, catchphrases and the perky-eared whippet drawn by her father, the painter Lucien Freud – onto cushions, blankets and candles. This year, alongside Retrouvius’ Maria Speake (who worked on Freud’s home and her brand’s London store, 1), she has designed a penthouse in the Grade II-listed BBC Television Centre in White City. ‘It feels natural and exciting,’ Freud says of working on the apartment, which opens and goes on sale to the public in September (@bella_freud; bellafreud.com; televisioncentre.com). (3) had a very profound efect on me, too. It made me excruciatingly aware of racism and my selfrighteous prejudices in a way that I hadn’t previously appreciated. I’ve been reading The Andy Warhol Diaries for ages, which is great for when I’m feeling anxious as it’s both bland and interesting. I like to have a few books on the go – I’m ﬁnishing Donna Tartt’s A Secret History, which is the opposite, almost too disturbing, and have just started Chelsea Girls by the poet Eileen Myles. My top five film list goes as follows: Apocalypse Now, Some Like It Hot (4), The Producers, Freaks and La Grande Illusion. They are like part of my DNA. Oh, and I must add Ken Loach’s Kes. I saw it when I was ten or 11 and was so moved that I have never dared watch it again. My favourite gallery is the Courtauld Institute (5) at Somerset House, where I always look at Manet’s A Bar at the Folies-Bergère. The last exhibition I saw was the Picasso 1932 show at Tate Modern, all about his passion for Marie-Thérèse Walter and the amazing portraits he painted of her (2). It was horribly crowded, though – everyone obviously wanted to get in on the love. My formula for a fun night… If I get a chance to dance my head of, preferably with a gay man, then I know I’ll be happy. SPRING FORWARD Amusingly named after the tumbling spring toy for children, the ‘Slinkie’ collection of rugs by Patricia Urquiola for CC-Tapis features three designs. Each is inspired by organic shapes, as well as the colour wheel, with tonal graduations realised in soft Himalayan wool. From £4,769 (cc-tapis.com). WA B I - S A B I WA L L S ‘Shades of Pale’, the new collection of wallcoverings by Brian Yates, is inﬂuenced by the materials used in traditional Japanese interiors. We’re drawn to the undulating texture of this basket-woven raia. Other designs are made from bamboo, jute and sisal and all come in understated, muted tones, making them the perfect backdrop to a tranquil decorating scheme. Raia weave on non-woven backing, £185 per metre (brian-yates.co.uk). TILE ICON New tiling brand Claybrook, based in London’s Shoreditch, ofers 26 styles for walls and ﬂoors in a variety of sizes, prints and colours – from the glass geometric ‘Conﬁserie’ to the encaustic ‘Old Havana’ and the classically beautiful marble mosaic ‘Brookhaven’ (above). Order online or visit to discuss your needs with the in-house design team. From £39 per square metre (claybrookstudio.co.uk). E U R O S TA R Now available in a range of new shapes – including rectangular, lozenge, diamond and circle varieties – Clé’s stylish ‘Belgian Reproduction’ tiles pay homage to designs that can be found on the ﬂoors of the grand courtyards of northern Europe. Handcrafted from wood-ﬁred terracotta, they are unglazed and have a delightful aged patina. From £179.50 per square metre (cletile.com). FLAWLESS FLOORING Ecora, an interiors company known for its sustainable and ecologically responsible products, has added a choice of 40 new ﬁnishes to its existing range. We love ‘Oak Hoxton’ – a smoked oak with dark brown and black tones – in the ‘Mansion Weave’ pattern. £160 per square metre (ecora.co.uk). SHADES OF SKYE When professional decorator Alasdair Campbell couldn’t ﬁnd an exterior paint that would withstand the dramatic weather of the Isle of Skye, he took matters into his own hands and set up the Isle of Skye Paint Company. There are 32 colours, all of which reﬂect the island’s landscape, and can be used indoors and out. From £24.50 for 2.5 litres (isleofskye paintcompany.co.uk). Jane Rockett and Lucy St George, co-founders of homeware brand Rockett St George, have turned their hands to designing wallpaper. The ﬁve new patterns – which include a Gothic lace design and a leopard print – all display a hint of the rock-and-roll aesthetic that the ﬁrm is known for. Our favourite is ‘Oriental Garden’ ( below), with bold Chinoiserie motifs. £99 per roll (rockettstgeorge.co.uk). JOIN THE GUILD Designers Guild’s ﬂagship store on London’s King’s Road is now bigger than ever, with a new space dedicated purely to its extensive range of wallpapers, fabrics and paints. It’s a true one-stop shop for all your decorating needs (designersguild.com). 2. BEST FOR EGGSHELL FARROW & BALL Eggshell paint is perfect for adding a silky sheen to exterior wood and metal surfaces, but Farrow & Ball also has fantastic matt, quick-drying and water-based masonry paints in its 132 colours. Pictured ‘Cook’s Blue’ masonry paint, £80 for five litres (farrow-ball.com). 3. BEST FOR MULTIPLE FINISHES LITTLE GREENE From quick-drying gloss to exterior eggshell and masonry paints, Little Greene offers a wide range of outdoor solutions. There’s also ‘Tom’s Oil’ eggshell, which gives woodwork and metal a traditional finish. Pictured ‘Yellow-Pink’ masonry paint, £65 for five litres (littlegreene.com). 4. BEST FOR COLOUR SELECTION VALSPAR Choose from around 200 garden and decking paint shades. Still not able to find the exact hue you want? The brand’s colour matching service, available at B&Q, allows you to create bespoke options. Pictured ’Peach Parfait’ masonry paint, £25 for 2.5 litres (valsparpaint.co.uk). 5. BEST FOR A CHALKY LOOK DESIGNERS GUILD Hardwearing and offering protection from the elements, this water-based masonry paint can be used on walls, bricks and render. A low, five per cent sheen level gives it an attractive chalky, matt appearance. Pictured ‘Pale Jade’ masonry paint, £44 for 2.5 litres (designersguild.com). 1. BEST FOR ECOFRIENDLY LIMEWASH BAUWERK This Australian company specialises in natural lime paint, which absorbs into the wall and allows the surface to breathe. Suitable for all masonry, but not wooden doors or trims. No undercoat or sealer needed. Pictured ’Saint Germain’ lime paint, £31 for one litre (bauwerkcolour.co.uk). to be scattered, thus making calmer, clearer water more likely ‘Deep Water Green’, £48.50 for 2.5 litres, to appear greenish blue. Paint & Paper Library (paintandpaperlibrary.com) Another reason why we tend to immediately associate water with the colour blue is cultural. Perhaps due to advertising, holiday memories or childhood imagery – seas are nearly always ‘Marine’, £44 for 2.5 litres, Designers Guild (designersguild.com) perfectly azure in picture books. Aqua’s watery associations lend it some ocean-like attributes: it’s refreshing, summery, nautical, a little mysterious and very capacious. Aquas come in almost as many shades as the sea itself: near-turquoise, minty, dark teal or the clear, untroubled blue of the aquamarine stone. In our homes, this colour can be taken in many design directions. One is the more synthetic, mid-century route, with less grey and perhaps a dash more blue. Think icy movie-goddess dresses deepening to that tint redolent of Studebaker cars – this works better on accessories than on whole walls, where its single-mindedness soon palls. The inkier, greyer aqua hues have a more modern feel. Little Greene’s ‘Turquoise Blue’ (see above right) feels clean and refreshing, making it perfect for bathrooms or kitchens. Toe-dippers might try Claire Gaudion’s abstract ‘Rhythmic Tides’ rug (£359; clairegaudion.com), which includes several of the sea’s inﬁnite hues, from winedark to… let’s call it green. KITCHENS & BATHROOMS / FLOATING ON AIR Designed with open-plan living in mind, the new ‘+Venovo’ kitchen by Poggenpohl – including an island, tall unit and sideboard – looks as though it is suspended mid-air, thanks to its reﬁned metal supports. It’s available in the brand’s seven signature colours, as well as a wood veneer, with legs in chrome, satin black or white. From £35,000 (poggenpohl.com). SOFTLY DOES IT I’M WITH THE BAND German designer Sebastian Herkner’s ‘Ribbon’ bathroom range for Ex.t consists of a sleek console basin and bathtub. Each piece features a simple metal band (the bathtub is also available without it, as pictured). From £1,412 (ex-t.com). In need of a gentler cleanse? Hansgrohe’s ‘Raindance’ shower systems now feature the brand’s ‘PowderRain’ technology. It provides a micro-spray that is designed to be released softly on the skin to mimic the hydrating feel of misty rain. From £170 (hansgrohe.co.uk). LET THERE BE LIGHTS Your bathroom lighting options just got interesting: to coincide with the opening of his brand new headquarters, shop and restaurant in King’s Cross, London, Tom Dixon has launched a series of wall lights and pendants that work in both wet and dry rooms. Choose from copper, brass, glossy black and Morwad marble ﬁnishes. From £210 (tomdixon.net). Airport paperbacks may be convenient, but they won’t survive a dunk in the hotel swimming pool. The new Amazon ‘Kindle Oasis’, however, is waterproof and can last for a week on a single charge. Redesigned for easy one-handed reading, it has a seven-inch display that looks like paper, even in sunlight. Choose from a goldor graphite-coloured case. From £229 (amazon.co.uk). READY, JET SET, GO! Before you sit on a sun terrace sipping an Italian aperitif, you’ll probably have to negotiate a few planes, trains and Ubers. Thankfully, Horizn-Studios’ new smart cabin suitcase, the ‘Model H’, can help. Its removable battery pack keeps smart devices charged and the Japanese-designed ‘silent spinner’ wheels help you glide efortlessly to your destination. £239 (horizn-studios.co.uk). Looking for a stylish way to incorporate smart technology into your home? Sony’s sleek ‘Xperia Touch’ projector turns any wall or table into a touchsensitive 23-inch HD screen. It acts as a family hub, allowing you to leave notes, make Skype calls or view videos on YouTube. £1,400 (sony.co.uk). Early adopters of the electric car boom needn’t compromise on style. British ﬁrm Andersen has created the ‘A1’ charging point in ﬁve metallic colours or Accoya wood. The 7Kw model is weatherproof with a lifetime guarantee. From £1,199 (andersen-ev.com). ARCHITECTURE / CLOAKED HOUSE by 3r Ernesto Pereira Portuguese architect Ernesto Pereira is known for creating alluring, angular villas, where the distinction between the interior and the outdoors is blurred. Recently, he completed an open-plan abode, which, glazed on all sides, allows the surrounding trees to form part of the décor. Raised on stilts on a rugged hillside in Portugal’s city of Marco de Canaveses, the home sits on a concrete base that extends out onto a terrace, with large sliding doors. Minimalist yet elegant in design, the highlight of the interior is the ﬂoor-toceiling windows. Punctured holes in the concrete allow the site’s existing trees to ﬂourish, with the lush vegetation providing shade from the searing heat (3-r.pt). CASA FLOTANTE by Talleresque In a patch of forest at the heart of Mexico City, the tall, narrow, three-storey Casa Flotante stands, raised on stilts above the uneven terrain. This home and work studio was designed by Juan De La Rosa of architectural practice Talleresque. The eco-friendly timber-built design, inspired by the towering trees around it, features a mix of Japanese and tropical inﬂuences, with sliding doors, glazed panelling and a magniﬁcent wraparound staircase (talleresque.com). What inspired you to become an architect? I knew I wanted to do something related to the arts, but found the idea of going to Fine Arts school a bit intimidating. One week before the applications closed, I just decided to go for architecture. I became hooked, so I guess it was a good hunch. How can architects bring value to housing design? One of the most recurrent discussions we have at the studio is the diference between exchange value and use value – some design cares too much about the former. With the support of the Sistema Nacional de Creadores (a Mexican art association that champions creativity), we are exploring how buildings that result from this lead to empty spaces in the city. Describe your working process. We are a team of eight, and we usually discuss the initial ideas together. We start by discussing what the ‘problem’ of the project is – which is basically what it can express and explain to us. We then work with a lot of references, which are not necessarily architectural. Focus on the long-term experience rather than the here and now. Trust your instincts and be honest about who you are instead of following a trend that you’ll grow out of anyway. Choose organic materials that wear well – metals, stone, wool, leather, wood. This is the only rule that has remained a constant for us, and it’s how we form our colour palette. It helps to create atmosphere. Go for things you’ve fallen in love with – not pieces that ﬁt a certain style. This adds personality. We source furniture from absolutely everywhere. Well thought out lighting is key. You can use it to completely change the look and feel of a space. Think in layers and include task lighting, as well as lamps, to create warmth. It’s something we’re very good at in this part of the world, as it’s so dark for most of the year. Mix vintage with bespoke to create character. There’s an abundance of good vintage shops in big cities and, of course, loads online. Invest in quality items that will last for years without going out of fashion. One of our most important principles is to avoid trends. A good interior should be timeless, and the best are filled with things that have meaning to their owner. Don’t worry about matching. A natural style will emerge over time, and the space will exude confidence. Redecoration can happen often. It can be a small refresh or a refinement rather than a revolution. Avoid designer lighting in favour of something simple and understated that creates a subtle wash of illumination throughout your home. In our interiors, nothing ever becomes so much of a focal point that it detracts from the rest of the space. EXPERT ADVICE Function has to come first, so plan to make sure everything physically works in a room. It’s the same with choosing furniture. In the past, I’ve learned the hard way and chosen chairs that look incredible, but are really uncomfortable. If they’re going to be used a lot, they must be comfy. Coco Chanel once said: ‘Get dressed, then take one thing off’, and the same rule applies to interiors. People have a tendency to overwork things, but sometimes, simple is better. Lighting can play a huge part in the feel of a room. When it comes to bedrooms, I prefer a central, decorative pendant light layered with small side lights and floor lamps. Downlighting can create quite a stressful space. EXPERT ADVICE Don’t just use wallpaper on walls. Fabric can add texture and warmth to your home, and gives a cosy but tailored look. If you make a collection of something, it becomes interesting. We collect meat platters at The Whitby and bowling shoes in the bowling alley at Ham Yard. Framed in Perspex boxes, with a black felt background, they become works of art in themselves. Colours don’t have to match. If they complement each other it’s more interesting. I’ll often have a plain wall, then introduce one large pattern alongside smaller ones, so that they’re not competing. Breaking the rules and stretching the imagination is fun. A small detail can provide the lyrical element that brings a whole room to life. Look for unusual fabrics with something that captures your imagination. They will be the thing people always remember. I like to build up what I call an ‘envelope’ of timeless materials and finishes that can serve as a beautiful blank canvas for the rest of the furnishings to be layered on top of. This way, the scheme will have a grounding that can endure over several small, less challenging refreshes. Learning to edit your belongings is a great skill to develop. When you gain a bit of space in a room, there’s more opportunity to appreciate each object, piece of furniture or artwork. Be willing to have some fun and add a piece of art, a cushion or a feature chair that’s in complete contrast to the aesthetic in the rest of your home. Allow your space to be a personal reflection of your journeys and adventures. Bring in inspiring books, an object that you found that triggers a moment seared into your memory, or sentimental things that remind you of a magical time in your life. VILLA G, FRANCE A concrete parallelepiped (or rhomboid), this house appears to levitate over a hillside in southern France, in bold deďŹ ance of gravity. Cantilevered on either side of a minimal garden, the villaâ&#x20AC;&#x2122;s uncluttered interior asserts itself with clarity. In its centre, a wooden volume gathers together all of the utilitarian areas of the home, from the kitchen to the bathroom. On either side of this core, the living room and bedroom unfurl with ample dimensions and wide windows that allow your gaze to take ďŹ&#x201A;ight across the rural landscape. YVES SAINT LAURENT MUSEUM, MOROCCO To protect the Fondation Pierre Bergé – Yves Saint Laurent’s couture collections, Studio KO had to design a building to keep the potentially damaging rays of the sun at bay. Its exhibition galleries, conservation areas and auditoriums are largely windowless by necessity. The interior is smooth and shimmering, while the outside seems woven and colourful. S E AT I N G ‘ F I L N O I R ’ B Y CHRISTOPHE DELCOURT FOR MINOTTI This project is built around the concept of a thread (or ﬁl in French, giving this chair its name), a design feature that is a metaphor for continuity. Here, the thread takes the form of black metal tubing, which not only outlines the piece’s silhouette, but supports and envelops it. From gorgeous, puttycoloured upholstery to perfectly soft goose-down ﬁlling, all of the materials for this design have been meticulously selected. This great attention to detail, craftsmanship and sophisticated yet simple style is what sets the ‘Fil Noir’ apart. £4,825 (minottilondon.com). DESIGNER OF THE YEAR F O R M A FA N TA S M A Andrea Trimarchi and Simone Farresin – the Italian-born, Amsterdam-based duo that make up Formafantasma – are leading the design pack. Their passion is translating a love of craft into pieces that blend artistry with industry. At last year’s Milan Furniture Fair, their designs were unforgettable. Among them were the ‘Blush Lamp’ and ‘WireRing’ lights created for Flos: the ﬁrst exploits the potential of a dichroic ﬁlter to project ‘brushstrokes’ of coloured light onto the wall; the second is a luminous circle ﬁxed to the wall by its electric cable – the functional made beautiful. Also worthy of note are the studio’s ‘Cromatica’ tiles for Cedit Ceramiche d’Italia. The range explores how to recreate the variety and subtlety of colour seen in traditional, artisan tiles (formafantasma.com). TA B L E WA R E ‘WEDGWOOD BOWL ON RED SPHERE’ BY LEE BROOM FOR WEDGWOOD Future collectors’ items, the pieces in this capsule collection are inspired by Wedgwood’s 250-year history. Crafted by the brand’s skilled artisans, they have an Art Deco aesthetic, with their geometric forms highlighted by a soonto-be-iconic monochrome and glossy red palette. £7,500 (wedgwood.co.uk). FURNITURE ‘GREEN LIGHT’ BY OLAFUR ELIASSON FOR MOROSO This furniture range, consisting of a shelving system (right) and table, was born from an artistic workshop created for last year’s Venice art biennale by Danish-Icelandic artist Eliasson. The project invited refugees and members of the public to collaborate on building modular lamps that produce a green light. The complex structure of the lights was created using repeating wooden triangles, and that same design basis has been used for Moroso’s ‘Green Light’ bookcase, made using steel frames and wood. Available late 2018 (moroso.it). LIGHTING ‘ARRANGEMENTS’ BY M I C H A E L A N A S TA S S I A D E S FOR FLOS London-based Anastassiades is known for his spherical lighting designs in opaque glass (the focus of previous collections), but now his attention has shifted to the possibilities of pure lines. ‘Arrangements’, ﬁrst presented at last year’s Euroluce Fair, consists of modular, interchangeable forms, each hanging from the other, like pieces of an elegant necklace. Indeed, Anastassiades talks of jewellery as an inspiration. ‘It is no coincidence that the word pendant has a double meaning, existing both as a chain worn round the neck, and a light designed to hang from the ceiling,’ he points out. The shapes that make up ‘Arrangements’ each feature an LED strip that produces a soft glow, and can be combined to create chandeliers. £2,370, Heal’s (heals.com; ﬂos.com). B AT H R O O M ‘ I M M E R S I O N ’ BY NERI & HU FOR AGAPE The ﬁrst bathroom project from this Chinese design practice, Neri & Hu’s ‘Immersion’ bathtub was created to answer the needs of younger generations who tend to live in smaller apartments. The tub makes new use of a traditional design to get around the issue of space, following in the footsteps of soaking tubs, popular in Japan. Deep rather than wide, it provides a perfectly relaxing experience and, with its minimal lines, stylishly updates an ancient idea for contemporary living. £7,080 (agapedesign.it). FA B R I C ‘ T R U E V E LV E T ’ C O L L E C T I O N B Y I N D I A M A H D AV I F O R P I E R R E F R E Y ‘After decades of beige and white, colour is dressing our living rooms,’ declares Mahdavi – referred to as the ‘queen of colour’ – who, with this collection of velvets, intends to create joy. The designer’s passion for brights can be traced back to her IranianEgyptian culture and cosmopolitan childhood (born in Tehran, she grew up in the US, Germany and France). Pick from two prints, one with a diamond pattern (below) and one striped, both in a choice of 80 colours. £223.20 per metre (pierrefrey.com). O U T D O O R ‘ M A N I L A’ C H A I R B Y PA O L A N AV O N E F O R B A X T E R With a slender structure and an exotic silhouette, this outdoor chair by Italian designer Navone is designed to bring glamour to gardens. A large part of its visual strength is thanks to its handpicked materials – manila reed tubing (which gives the project its name), oxidised copper for the frame, and leather-wrapped technical cord for the woven seat. In order to protect the chair from the elements, a special leather tanning technique and Indian ink dye have been used, which limit the ageing and fading caused by UV rays. This extra protection ensures this design will last many summers. £7,056, Silvera (silveraltd.co.uk; baxter.it). BEDDING ‘WINGS’ B E D B Y J A I M E H AY Ó N FOR WITTMANN Is it a bird? Is it a bed? The focus of this design by creative Spanish designer Hayón is its adjustable upholstered wings. When folded in, they turn the bed into a cosy cocoon, the perfect place for a dreamy night’s sleep. When open, the wings create a striking proﬁle. It is this ability to alter the mood – to create intimacy or exuberance – that makes this such an interesting piece of design. The built-in bedside tables are covered in luxe leather and equipped with LED lamps that are perfect for some bedtime reading. From £15,869 (wittmann.at). For a hit of salty sea air, a taste of fresh Kent oysters and a peruse of interesting craft and design stores, head to Whitstable on the Kent coast. The picturesque seaside town is where artisanal joinery and design ﬁrm Kent & London began its business in a beach hut – it now has a showroom on London’s Hackney Road, but the original store remains an ever-changing source of inspiration (kentandlondon.co.uk). Nearby, in a former ﬁsherman’s cottage, lies Frank, a gallery/shop purveying paper goods and contemporary homeware (frankworks.eu). Finally, pick up a woven basket or marble wall clock at The Union House boutique (theunionhouse.co.uk). Welcome to Wales’ take on the Italian Riviera: the technicolour village of Portmeirion (left) was dreamt up by wealthy traveller Sir Clough Williams as a reimagination of Portoﬁno in the 1920s, and today plays host to Festival No.6, an annual music and culture weekender. If camping isn’t for you, rent a local cottage or stay at one of the village’s B&Bs after a day of listening to author Will Self give a reading on the piazza, partying to garage music in the woods and dining at a white-tablecloth banquet of locally caught ﬁsh by the sea’s edge. From £180 for a weekend ticket, 6–9 September (festivalnumber6.com). Mobiles, sculptures (such as Sword Plant, left) and surrealist canvases will further brighten the bucolic landscape of Bruton, Somerset this summer, when this cutting-edge gallery’s solo exhibition of the American 20th-century sculptor lands. Of particular note and charm are the handmade household devices (until 9 September; hauserwirthsomerset.com). For an after-show bite to eat, visit Roth Bar & Grill, the gallery’s art-ﬁlled brasserie, or At The Chapel, a converted 17th-century church serving delicious Mediterranean fare (atthechapel.co.uk). If you want to hunt for homeware that you won’t have seen before, support the next generation of creatives or just pick up boundary-pushing and functional designs, visit New Designers in Islington, London. Britain’s biggest undergraduate design extravaganza is an interiors industry favourite – it’s where Thomas Heatherwick was talent-spotted in the 1990s. We’re excited to see the One Year In showcase, revealing what 2017’s graduates have been up to in the past year – particularly Joanna Hejmej’s ceramic lights and Alexander Lohr’s oak chair. 27 June–7 July, from £12.50 for a day ticket (newdesigners.com). Achieve total relaxation at this new hotel and spa in The Lake District, the ﬁrst outpost to be opened by new hotel brand Another Place, founded by the team behind Cornwall’s Watergate Bay Hotel. Enjoy the scenery by kayaking across Ullswater, the area’s second largest lake, or simply gaze at your surroundings from the ten-metre swimming pool, sauna and spa. After a long day’s sightseeing or pampering, be sure to book a table at the hotel’s Rampsbeck Restaurant – its pale green walls and crimson seats are stylish, while the cured Cumbrian ham and bitter leaf salad has to be tasted. From £200 per night (another.place/the-lake). Known for cleverly pairing ﬁlms (both classics and the year’s big blockbuster hits) with fantastic pop-up outdoor venues across the UK, The Luna Cinema turns ten this year. To celebrate a decade of movie magic, it is putting on a stellar season. Highlights include The Darkest Hour beamed onto a screen in front of Blenheim Palace, where Churchill was born; Jaws, which can be watched from a dinghy on Brockwell Lido; and Victoria & Abdul at Queen Victoria’s birthplace, Kensington Palace. New venues include Peckham Rye park and York Minster. Tickets from £13.50 (thelunacinema.com). HOUSEHOLD GARDENS The National Garden Scheme encourages green-ﬁngered homeowners to open their well-tended lawns and ﬂourishing ﬂowerbeds to the public on one day a year, with the small admission fees (usually £5) going to nursing charities – more than £50 million has been donated to date. Pay a visit to one of our six favourites (ngs.org.uk) TOWN PLACE GARDEN, SUSSEX Look out for the box topiary in the shape of Henry Moore sculptures, grasses inﬂuenced by Dutch garden designer Piet Oudolf, plus 600 roses, dahliadotted potager and an 800-year-old oak tree for good measure. Open on various dates between 14 June and 8 July. B AY T R E E H O U S E , WINCHESTER The rill and pleached (gardening-speak for trained to grow ‘ﬂat’) lime tree square brings modern lines to this lush landscape of Mediterranean plants and blousy perennials, complete with a wildﬂower orchard. Open 5 July. 1 5 T H E AV E N U E , CHEAM, SURREY Designed by Chelsea Flower Show Gold medallist Marcus Barnett, with box hedges pruned to resemble cloud formations, this garden also features a collection of contemporary sculptures. Open 28 May and 2 June. THE JUNGLE GARDEN, LEEDS ‘Gardening is an exercise in optimism,’ reads the website for this takeover of a suburban backyard, overseen by homeowners Nick and Gill Wilson. The plot contains towering Gunnera plants, cherry-red orchids, a bamboo lodge and ponds ﬁlled with Japanese carp. Open 24 June and 29 July. WORKSHOPS Experimental ﬂoristry is all the rage. Learn how to make breathtaking ﬂoral displays at these inspirational courses THE LAND GARDENERS Sign up to the ‘Grow your own cut ﬂowers’ one-day workshop held by The Land Gardeners – the soil specialists, garden designers and growers Bridget Elworthy and Henrietta Courtauld – at either their own plot in Oxfordshire, or London’s Flower Appreciation Society. A ticket includes lunch, a handbook and ﬂowers to take home. 14 June and 10 October, £245 (thelandgardeners.com). FIRENZA FLOWERS For a masterclass on building almost architectural ﬂoral displays, head to Yorkshire, where arranger Fiona Pickles of Firenza Flowers studio ofers ‘Large scale installations’ workshops. Fiona provides ladders, barrels of blooms – from dahlias to hedgerow berries and crabapple branches – and expertise on how to design and structure your artworks. Lunch is included and pupils are welcome to take the ﬂora home with them. £435 (ﬁrenzaﬂoraldesign.co.uk). FINE DINING No need to book a ﬂight to taste the world’s most exciting cuisines – simply book a table at one of these London restaurants OMAR’S PLACE Kudos to London design duo Sella Concept, whose polished terracotta walls, pistachio-coloured terrazzo and end-grain wood ﬂooring make arriving at Omar’s Place in Pimlico akin to stepping into a sun-soaked tavern. Egyptian chef Omar Shabaan has brought the very best of eastern-Mediterranean dishes from his homeland to this Grade II-listed Victorian former pub – the squid tartare and fresh lemons perched on a slab of marble is as much a sculpture as it is a starter (omarsplace.co.uk). LAHPET Over in Shoreditch, you’ll ﬁnd Burmese kitchen Lahpet, which started as a stall on nearby Maltby Street Market and serves gloriously fragrant dishes, such as mohinga (catﬁsh and lemongrass chowder) and tea leaf salad. Plus, the interior’s fantastic tiles are a real feast for the eyes (lahpet.co.uk). such as ﬂowering comfrey and catmint, and the planting elsewhere echoes a mix of culture and religions, with bamboos, ginkgo, hazel and winter-ﬂowering plum trees (thehiddengardens.org.uk). S T D U N S TA N - I N - T H E - E A S T, LONDON Built in 1100, the church that originally stood here was burned down by the Great Fire of London, then restored, only to be bombed in the Blitz. Its shell is now a public garden. We love how the Gothic architecture, including Christopher Wren’s 17th-century steeple, is softened by roaming vines, trees and curving cobbled paths (cityoﬂondon.gov.uk). Book now for an end-of-summer pop-up dinner in the forests of East Lothian, hosted by Amanda Farnese Heath, aka the Mad March Hare – a photographer and cook who grew up in an Italian household before moving to the North Berwick coast. The evening of 28 October will include an enlightening lecture on mushrooms by forager Monica Wilde (accompanied by a single-malt sharpener), then a trip to the magically decorated copse (right) for a candlelit seven-course dinner cooked over ﬁre. Guests can stay in nearby treehouses. Dinner, £125; treehouse stays, £50 per person (themadmarchhare.com). ‘I want the paint to work as ﬂesh does,’ Lucien Freud said in 2009. In this blockbuster show of British portrait painters, it is startlingly clear that he – and his peers, who included Frank Auerbach and Paula Rego – achieved this demanding aim. Don’t worry if you can’t make it to London’s Millbank before 27 August when the exhibition closes (tate.org.uk) – the show’s curator, Elena Crippa, has written a book exploring how, where, when and why these artists painted the human form so engagingly (£25, Tate Publishing). 2018 is the tenth year that this festival of contemporary art has been running, and it’s as ground-breaking and exciting as ever. The theme for this year’s ten weeks of artworks, special projects and programme of events is ‘Beautiful World, Where Are You?’, taken from the title of Friedrich Schiller’s 1788 German poem questioning uncertainty on planet Earth. As you’d expect, there are provocative works on show across the whole city, including at venues such as the space-age Metropolitan Cathedral, the dockside Tate Liverpool and RIBA North. 14 July–28 October (biennial.com). The eccentric Grade I-listed house and grounds of Port Eliot (right) have been hosting festivals since the punk and folk music ‘Elephant fayre’ of the 1980s, and this year, the event has changed again under new directorship. Alongside old favourites – swimming in the estuary and the literary pub quiz – will be Anna Jones cooking in the vast Georgian kitchen, comedian Robert Webb in conversation and fashion collector Daphne Guinness introducing visitors to the new Fashion Foundation in the walled garden, which will hold workshops, exhibitions and more. 26–29 July, day tickets from £62.50 (porteliotfestival.com). ‘ C AT WA L K I N G : FA S H I O N THROUGH THE LENS OF CHRIS MOORE’ AT THE BOWES MUSEUM Known to some as the V&A of the north, County Durham’s The Bowes Museum attracts stellar touring shows, but also curates brilliant new exhibitions in its own right. Check out its fantastic exploration of ‘king of catwalk photography’ Chris Moore’s career highlights, starring snaps of all the ‘supers’ from Jerry Hall at YSL to Naomi Campbell at Vivienne Westwood (7 July–6 January 2019). The venue’s public gallery also has a permanent collection, with works by Goya and Canaletto (thebowesmuseum.org.uk). WEEKEND GETAWAYS From a boathouse to a treetop dwelling, these refuges offer staycationers a breath of fresh air B A C K WAT E R , N O R F O L K Both Scandi and East Anglian boathouses inﬂuenced London studio Platform 5 Architects’ design for this four-bedroom eco-house on the Norfolk Broads. The outside is clad in black-stained timber, while the interior is chic. There’s also a lakeside terrace, jetty and rowboat. From £1,900 for a three-night stay in September (backwaternorfolk.co.uk). CHURCH COTTAGE, COTSWOLDS Make like William Morris, who summered at nearby Kelmscott Manor (now open to the public), and hole up at the beautiful Church Cottage in the same village. The stone ﬁve-bedroom farmhouse now has a light, bright kitchen that looks straight out through its patio doors to olive trees, potted lavender and a heated pool. From £551 for three nights (luxurycotswoldrentals.co.uk). K U D H VA C A B I N S , C O R N WA L L At Kudhva, sustainably-built lodges on stilts ofer views down to the English Channel. Designed by New British Design studio’s Ben Huggins, they have a rustic, pared-back kind of feel, with outdoor showers and no internet. Wake to the dawn chorus, cook breakfast over the ﬁre pit and then go for a swim in the lake or surf in the sea before a soak in the hot tub. £114 per night (kudhva.com). DYEHOUSE Yorkshire based furniture and homeware brand DYEHOUSE was founded in 2015 by award winning architect and interior designer, Mark Lee. Operating from a converted dyehouse, the brand draws inspiration from the natural, rural surroundings. A meticulously conceived and crafted collection, created from materials that are largely characteristic of Yorkshire â&#x20AC;&#x201C; principally oak, steel and leather. All products are made to order and bespoke commissions are welcomed. You can see some of the range at the internationally renowned Yorkshire Sculpture Park. Visit: www.thedyehouse.com +44(0)1484 668 018. AMMIL bench - blackened steel with leather wrap and solid oak shelf. Photo ÂŠJohn Britton. For 50 years, Focus has been imagining the future. JANEY BUTLER INTERIORS & LLAMA ARCHITECTS FORM PART OF THE LLAMA GROUP. Creating award winning residential and commercial projects in the UK and abroad. INTERNATIONAL AWARD WINNING ARCHITECTS & INTERIOR DESIGNERS. The Coach House, Capesthorne Hall, nr Alderley Edge, Cheshire. SK11 9JY. CELEBRATING 40 YEARS MAKING THE FINEST WOODEN LOO SEATS SINCE 1977 During that time they have grown the business and supplied some of the most prestigious homes and hotels in the world. All parts of all our seats are hand made in England to the very highest standard. Every item of furniture is made from durable, sustainable, grade-A teak, built to last and skilfully handcrafted for your ultimate comfort. Versatile range of teak dining sets, garden benches, luxurious sun loungers and steamer chairs - perfect for contemporary or traditional settings. Titan Teak Dining Sets* CS395 4 Seat £799.99 CS157 6 Seat £1349.99 CS400 8 Seat £1849.99 All tables are delivered with pre-drilled parasol holes and plugs. All items delivered fully assembled except Sun Lounger which requires minimal assembly. *Cushions and parasol sold separately. Prices valid until 31/07/18 and include VAT but exclude delivery.